An easement allows one person to use another person's property for a specific purpose. In New York, easements are created for many different reasons. The easement deed is the specific instrument that creates this right. An easement can be either appurtenant or in gross. An appurtenant easement benefits the dominant estate and runs with the land, while an easement in gross benefits an individual or a legal entity. An express easement is an interest in real property that is created by deed, contract, or other instrument in writing. When obtaining an easement for the purpose of exposure of a solar energy device, the instrument should be created in writing and will be subject to the same conveyancing and recording requirements as other easements in this state ( 335-b). As an interest in real property, an easement deed must be signed and acknowledged by the grantor, and certified according to law. Acknowledgments must be made by the grantor (292). 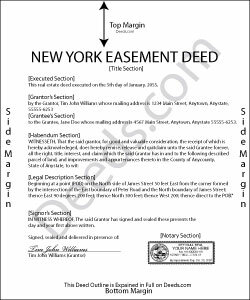 If acknowledged within the state of New York, an easement deed can be acknowledged before a justice of the Supreme Court, an official examiner of title, or a notary public. Acknowledgments can also be made before any of the officers listed in 298, but these officers must be operating within their own jurisdiction. Out-of-state acknowledgments are valid in New York if the easement deed has been acknowledged according to the laws of such place and if it is accompanied by a certificate stating such fact (299-a). In order to provide constructive notice, an easement deed must be properly recorded in the county where the property subject to the easement is located. If the deed is not duly signed, acknowledged, certified, and recorded, it will be void against a subsequent purchaser or one who acquires by exchange the same real property or any portion of it, in good faith and for a valuable consideration, from the same vendor whose conveyance is first duly recorded ( 291). James D. said: It was very easy to set up the account but then everything is very costly. I didn't see any publications that were free to account holders, so as infrequently I have to do a title search, I may as well just hire an online service to do the legwork too. Harry C. said: I got the wrong state and now they want to charge me again for the proper state. My fault, BUT!!!! Reply from Staff: Sorry to hear that Harry. We've gone ahead and canceled the order you made in error. Have a wonderful day. Teri B. said: Glad to have all of the helpful extra information, even though they don't answer all questions for all situations. So, I accessed public records and asked questions at the auditor's office. Also, on my Mac computer, filling out the actual deed form is a challenge because the screen jumps to the last page everytime I try to type a few letters or hit the return key, so I'm rollling back up to the first 2 pages after most keystrokes. A bit annoying. Overall, happy to have these form options are available! There is really no need to wait and pay for an attorney when all the information needed is available via public records. Fill in the blanks! Reply from Staff: Thanks so much for the feedback Teri. There are known issues between Adobe and Mac, we try to work around them as much as possible. Have a wonderful day!